This car has always left me conflicted. It has always played second fiddle to whatever projects I had going at the time. I could never figure out if I wanted to "upgrade" or if I wanted to just keep it stock. So, nothing really gets done on the car. I haven't even cleaned under the hood yet. Actually, I noticed the other day, I never cleaned the rear glass inside. Anyway, on with the story. One evening in December, 2008, I had just returned from helping a friend of mine look at a couple of Minis at a local dealer. Upon my return home, I received a call from my friend Ray. He wanted me to check out this ad on Craigslist for an '83 533i for $2400. The ad was for a local dealer. They had a nice-looking car in the photos with 136,000 miles. It was Schwarz/Pearl Beige, had stock TRX wheels and tires, an M5 airdam and what looked to be a Racing Dynamics trunk spoiler. It was at that point my father walked in and as usual asked what the car was on the screen and if it was for sale. Unlike every other car that I had been considering looking at in the past, he showed interest in this one. I showed him the photos. It was a Friday night, at about 6 pm. He wanted to go look at the car. Figuring a car lot would be open at night, we went to go see it. Their website said they were open until 7 pm. They lied. They were closed. We walked around the lot a bit looking for the car, and I spotted it up next to the office. It was unlocked, so I started going through it. It was actually a pretty clean car. Some things about it weren't great, but they were more than outweighed by many positive things. Even the TRX tires (over $400 each from Coker Tire) were recently replaced. A relatively clean car with lots of potential. My father decided he wanted to tell my mother and that we should all go look at it the next day. The next morning, we all drove out to the lot. Mostly comprised of Kias and Daewoos, with the occasional Hyundai here and there. I asked to see the '83 BMW and they got the key. Started right up, and it idled a little high, but smoothly. It was a clean car overall and the best part is that it hadn't yet been detailed. I hate it when people put "ghetto shine" products all over their cars. Plus, this way, I could see how the car was cared for. The story on the car was that it was a 1-owner car, owned by a Wickenburg doctor. I could tell it was from a place that didn't have a BMW specialist as some of the really simple fixes were done other ways. Again, I saw potential in this car. It was time for the test drive. My father went along and my mom stayed behind to talk with the salesman. The car drove nicely. No shimmies, everything felt tight, the car had plenty of power and it was comfortable. My father was very impressed. Right about the time he said he was impressed, the car died. It wouldn't restart - or even crank for that matter. Unfortunately, neither of us had a cell phone, as my battery had just died and his was back at the dealer, so I called the dealer from a convenience store. They came to pick us up and said they'd have the car fixed Monday and if we wanted, we could come out again. I knew what was wrong, but I didn't share that info. I didn't have much interest in buying the car, but my parents kept trying to talk me into it (VERY STRANGE). I ended up saying I could fix that car, have all the parts and I could drive it home today. They suggested I call the dealer and tell them that. So, I did. I offered them $1400 for the car. Turned it down. Said they had $1832 into the car, which I knew was a load of crap. We ended up settling on $1600 plus tax ($180) and they wave the document fee ($300) for $1780 out the door. I could live with that. It's a pretty clean car. So, I pulled the battery from my 535is, and grabbed an alternator off the shelf and drove out to the dealer to get the key to the car, which was still sitting on the side of the road. I fixed the car in 10 minutes, but the car wouldn't stay running. I called my friend Kyle and he suggested unplugging the coolant temperature sensor and reconnecting it, which fixed the issue. I drove it back to the dealer and did the paperwork. The car was mine. I then drove it home. It really didn't need much to be a nice car. Some bumper trim needed attention as well as a couple pieces of interior trim needed replacement. A new antenna was installed and then I started going under the hood. Someone had replaced the heater valve with parts from a hardware store, so I put a good one in. The fuse box was a mess, having had an inline fuse holder soldered in ON TOP of the box for the air conditioning. I decided to leave that for the time being, just replacing the holder to ensure everything works as it should. The car even had AC! I replaced the blower motor, as it was seized (probably the cause of the melted fuse, which led to the fuse holder). The car was really starting to take shape! Next up, while the car had a new cooling system, I didn't like the aftermarket hoses and nothing really fit right, so I replaced everything with BMW parts, and also went after sorting the slightly high idle, which after replacing all of vacuum lines/hoses, I narrowed down to the idle coolant temperature sensor in the thermostat housing. By putting pressure on the connector while removing it, the idle dropped to a perfect 750 RPM. I was shocked. That said, I replaced it, but the new one doesn't work right, which probably explains why it has a violet insulator, rather than white. I didn't want to drive the rubber off the nice TRX wheels, but I didn't really have anything suitable for the car, or did I? I had a set of 16x7.5 ET13 BBS RZs. They had a nice lip and I had them refinished with polished lips and gold centers for my 535is, but I never bothered to check that they fit over my 840CI Brembo calipers. They didn't, so I had a nicely refinished set of wheels just sitting. I never really cared for the gold I got from the powder-coaters, but interestingly, it was very reminiscent of the color used on the pinstripe applied on the car years ago, so it turned out I had the perfect wheel for the car! This car has always been a tricky one for me. Such a well-cared for car in nice shape, it's enjoyable in it's stock form. I've got another car (the 535is) that has coilovers and all sorts of aftermarket parts. I really didn't want another one. Nice 533s are few and far between. That said, there is no denying that a nice set of Euro bumpers can make a car. My friend Alex had a set of bumpers sitting atop a car at his shop for years. I asked him about them. They weren't his, but he said he'd ask the customer. Some time went by and that customer needed money. I got what turned out to be a partial set for $150. I had no front corners or any of the seam covers. Not the end of the world, as what I got was nice with good chrome. So, I set out on a search and honestly, if there's one thing you don't find much of it's bumper parts. I ended up finding a pair of corners with everything else I needed from a Portland guy who wrecked his car. The corners were damaged, but I knew that if I took my time, I could make them nice. That's exactly what happened. You'd never know they once looked like check marks. So, with the bumpers assembled, I bought a new early Euro valance, and had it painted along with a BBS airdam I had around. I had everything ready to go for the conversion, along with a nice set of lights. I had decided that this conversion would leave the car in tact with no cutting of frame rails, so no fog lights. By mid-March, 2010 I had all of the necessary pieces - even a set of turn signals modified to use stock US wiring in addition to having very bright LED arrays installed. Start to finish, the conversion took about four hours. I started at 11pm and had photos taken by 3:30am in a parking garage. In October, 2010, my friend Darin came over from San Diego and we planned to do a couple of projects on my 533 and on Ray's 635. My 533 got a nice Euro dash I had been saving and we finally installed the BBS spoiler, which takes at least two people. Made a huge difference to the car. Even better, just after he left, I installed new lockstrips, so the car was looking even better! 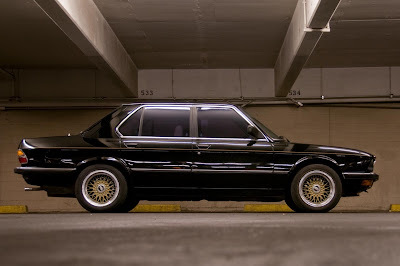 Beyond that and the manual E24 sport seats in the car, it's pretty much stock. Along with a set of rebuilt axles, we installed a 3.64:1 differential. It's said to be the best ratio for an M30. I like it a lot, but I'm not sure for this car. I have a feeling my 533 has lost some of it's "533ness." I also installed Dinan springs and Bilstein sports from my friend Roger's car. The have Ground Control spec E30 camber plates, too. I'm not sold on those either. I'm actually afraid I did what I was afraid I was going to do. One thing about this car is that it was a joy to drive as a stock 533i. 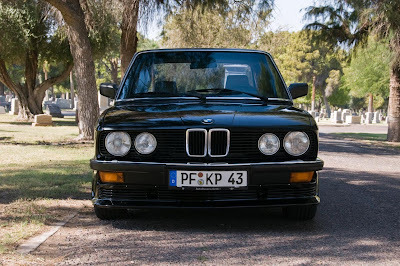 I was able to buy this car (back when storage was an issue and I lived in their house) because my parents thought it would be a fitting replacement for my schwarz/kirschrot 533i that I lost to an E36. 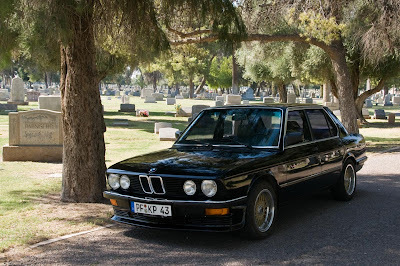 Being my first E28, I hadn't appreciated the differences that set the 533i apart from the 535i. By adding aftermarket parts and changing the 533, you're taking away some of the identity the car has. It sounds silly, I know. The car is also great to look at, but its one car that whenever I'm behind the wheel, I can't enjoy the car because I'm always feeling something is missing. The worst part is that I'm responsible for it. "It seemed like a good idea at the time." That said it's all completely reversible and there are probably plenty of cleaner 533s out there so it's not the end of the world.